Bill Griffiths was one of the most original, baffling and brilliant poets to write in English in the last 50 years. Indeed he was original to the degree that it was perhaps hardly in English that he wrote: he created his own language. If it usually looks like English (he freely throws French, German, Latin, Romany into his mix) the more you hear it, the more it sounds simply like Griffiths. It means like Griffiths. He had a way with words — as Thelonious Monk had with notes — that’s instantly recognisable and utterly impossible to convincingly imitate. Like Monk, Griffiths’ signature was written across his life. What Monk could do with wearing a hat, he could do with preparing a roll-up. Both were so entirely themselves that before ever you get around to trying to fathom what’s happening in their work you witness its authenticity. It stands alone. Monk sounds like Monk: put the work of a thousand poets in a pile and burn every archive, you could still find the Griffiths amongst it. Griffiths was a bundle of contradictions. With love and hate tattooed across his knuckles — a legacy of his biking days — you might have anticipated a temperament of violent oppositions and yet you encountered the calmest, most attentive of demeanours. He took inspiration from, and knew familiarly, people whose lives were precarious and marginal, who were sometimes barely literate in conventional terms, yet he created a unique literature from the contact. With Bob Cobbing, Michael Chant and Paula Claire in Konkrete Kanticle he performed as an unhesitating improviser yet, though he was a skilled musician, he took very little interest in musical forms based on improvisation. He liked Brahms, not blues. He was at the very least a good pianist with a profound knowledge of the piano’s history, but his taste was for 19th century instruments (1850 was a new-ish piano in his scheme) which were sometimes barely playable. Accomplished and well-informed as a scholar of the complexities of early poetries in Britain, his own poetry — like his drawings — could at times seem as intuitive or naive as a local, folk art. He was a radical avant-gardist yet scarcely any of the precedents that interested him were to be found amongst the practices of the various Modernist poets of the twentieth century. He had a simplicity that was both disarming and disorientating; he listened without prejudice and argued with rigour. He talked as knowledgeably about football or bread-making as the operas of Mussorgsky. As a publisher (his Pirate Press was enormously productive at different times in his career) he was both insistently homemade (his books were often handwritten and explicitly excluded from copyright) and alert to new technologies (he employed microfiche and web publication years before either were commonly exploited). Gently spoken, monk-like in his patience — in the few contacts I had with him I never knew him rushed — on the page his creative energy hurtled irrepressibly, anarchically and at times angrily, in all directions. A solitary man who lived on his houseboat or, in the last decades of his life, in his modest terraced home in North-east England, in all the tens of thousands of words that he wrote, although friends are often present, I know of hardly a hint of any intimate relation to another soul, man or woman; yet no poet has so thoroughly grounded his work in meticulous attention to the speech of others. A social historian, his inner integrities made him a nearly asocial man; you enjoyed his company but not his society. He conveyed a Rousseau-like belief in human nature — or perhaps just ‘nature’: there are animals or plants on nearly every page — that didn’t reject conventional structures so much as appear never to have a pressing need to incorporate them. And yet, while few men ever had less concern for mannerism, his manners were unfailingly courteous. These qualities combined to make him a visionary of the ordinary. He brought an alchemy to bear on the unremarkable that transformed it into glittering stuff. Most of the environment is locks. A lock about Sea Rocket as big as a toilet door. A rook over the Umbelliferae as tight as a baby’s pram. And when they lock, they block. These are the words of a man unafraid to set down exactly what the imagination offers, and they’re typical of page after page. Griffiths appeared so free of pretension and so seemingly unconcerned with how others might judge him that his words roamed easily amongst their own truth however it presented itself. While often hugely ambiguous, there’s rarely a tone that seems ambiguously poised for such tone belongs to a realm of social nuance that he bypassed. His words occupy a present tense of nearly animal being. A rook is a rook, is a thing that pecks. His metaphors can have a startling aptness. Where did he find anything so unlikely as “tight as a baby’s pram”? yet the image has an almost botanical accuracy. The music of the lines evolves with a geologic inevitability — a low rumbling so sure of itself that its echoes and parallels and rhymes embed a structure in the ears before you’ve had time to register it. He plays with words but his plays on words never seem like clevernesses. A ‘lock’ is a passage from one stretch of water to another, or a security device with a key — a highly evocative word then for a poet of houseboats who had reason to know more about the impact of prisons on a life than many. But this doubling of sense occurs not as a witticism. Indeed the italicised is of ‘Most of the environment is locks’ explicitly rejects the idea. He is simply making a statement of perceived fact. The pun occurs, uncomplicatedly, in the spirit of observed evidence. Except that, by refusing the sort of slippage of sense by which a pun usually works — Griffiths was never aloof from his material and quite free of any need to be thought witty for its own sake — the word ‘lock’ acquires its own uniquely Griffithsy resonance. Not least of the originalities of Griffiths’ approach to putting words together is his readiness to think of any manifestation of a text as provisional, rearrangeable and openly plunderable. For all the authority of their impact, his words could mask their origins as thoroughly as he himself could mask aspects of his own life. For this first collected edition of his earlier poems, Ken Edwards’ Reality Street imprint has called upon Alan Halsey as co-editor, one of the very few capable of manoeuvring through Griffiths’ textual minefields. 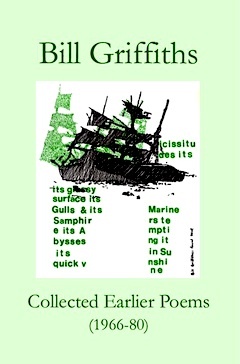 The task was to ‘collect all of Bill Griffiths’ poems, in largely chronological order’ up to 1980 while taking into account that he ‘was often cavalier with his work, fond of taking lines, stanzas and longer sections from one poem for transformation in another’, a practice that Halsey describes without blinking as ‘inevitably creat[ing] obscurities and anomalies in a retrospective account’. Anyone concerned to learn more about just how complex the editing process must have been should read Halsey’s detailed description in a forthcoming essay (“Abysses and Quick Vicissitudes”, in Mimeo Mimeo, 2010). Since Halsey focuses with particular care on the status of Griffiths’ texts and not on his own travails, The Salt Companion to Bill Griffiths (ed. W. Rowe, Salt, UK, 2007) should also be read by anyone seeking both an introduction to Griffiths’ work and an idea of how he himself could be simultaneously illuminating, non-proprietorial and misleading about his texts. Yet the remarkable thing is that, however essential to the editor and no doubt the scholar to have some fogs cleared, such extraneous information remains essentially extraneous to the reading. Griffiths writes with an intensity that’s riveting and that operates irrespective of how much of his material — its sources, references and treatment — one recognises. This is very hard to explain but I think it should be acknowledged because the tenacious reader will experience it: Griffiths’ writing almost never fails to be compelling even though it very often appears difficult, to say the least, to know where he’s coming from. Griffiths was 22 when he published these lines, nearly the first he allowed to surface in public and, for readers who followed his career, likely to have been the first they were aware of. No beginning since Beowulf was ever so striking as the ‘listen up’ of those first five letters. He seems to have ducked the need for any early period of imitation and entered on a career with the stamp of his voice already clear on the page. The lines are in fact the first in a poem that itself is part of a series entitled Cycles whose formal procedures reveal how Griffiths was clear about his directions from the outset. The series forms a cycle both in the sense that it’s a suite (like a song cycle, though the particular order of the poems may not matter) and in the way that the lines within the individual poems are grouped into little batches (whose order equally may be mutable) that fold in and turn upon themselves. In this respect Griffiths’ lines resemble the coloured chips of a kaleidoscope as they reshape and reform in a mobile, permanently recycled sort of congruence. And what are we offered here? A first word, straight out of Latin, that might send a reader scrambling for the dictionary, where he or she would find that ictus refers to an accent that falls on a particular syllable, from the Latin, icere, to strike. So Griffiths is announcing a poetry specifically of accent, with its roots in history; that is, if you will, a poetry of weight not syllable count (in the way of British poetries that existed before metre was imposed on them, following continental models, after the Middle Ages). But the exclamation mark alerts us to the fact that this is a voice, not an allusion to an idea, so that ‘accent’ also evokes the accentuation of local speech, which is exactly what the second line gives us. The single word of the third line, ‘kaleidoscope’, a 19th century invention out of Greek, tells us how the lines are meant to work (and I think anticipated Griffiths’ methods right to the end of his life); and ‘lock and knock my sleeping’ illustrates how the accenting of his kaleidoscoping words was to organise his lines (and more elusively suggests the visions of dreaming that often preface old British poems). Four lines then: the first from a written language that no one speaks, the second from a spoken language you might not expect to see written. The third is a neologism derived from yet another language. The fourth does what the others prepare you for. 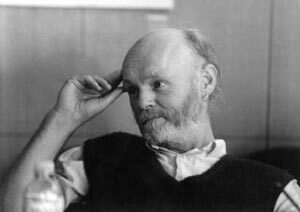 Griffiths knew he wasn’t ‘like ever to be still’ and set down in sixteen words at the head of his first generally known poem — in so far as he’s known at all — the elements of a life’s work. mo’ magnified thru and by. - like a labour — sky. steer or all-bake, t’ward beak-ball. This may be an extreme (though not really atypical) example and it may be that the earlier poems, now that we have them in an approximate chronological order and can see them in the context of Griffiths’ development, tend to be the most opaque that he made, but if the reader is discouraged by writing such as this then Griffiths is going to prove hard to swallow. His numerous formal inventions, followed through with the care of a laboratory technician, often present equally nuggety stuff to which we get few or no clues. Just getting this poem into a Word document sends the automatic corrector into apoplexy; ask Google what, or who, Clugel the Clever might be and it thinks either that I might be looking for a type of thoroughbred horse known as a ‘Belgian warmblood’ or it invites me to check my spelling. I can recognise shapes here — the rhythmic parallels, the alliterations and rhymes — and the virtuosity with which Griffiths shifts accents to keep the lines alive and kicking; and I can register how he gets energy from words often of one syllable that are brightly resistant to abstraction (even his invented compounds, as ‘all-bake’ or ‘beak-ball’, are often only aggregates of single syllable words stuck together in a knot). These are things that frequently characterise Griffiths’ poems. But I can’t get any nearer the references in the poem (though readily believe that they exist). The poem nonetheless has a sort of atavistic force. It makes the reader part of its ritual by invoking the real in a liturgy of spellings out. Nor finally is this all, for there’s a footnote to this reading of the poem: the magic spelt out in “Vance’s Clugel… ” will throw its dust of fascination in the eyes of many more than me. Having written the above paragraphs, a correspondence with the editor led to a chagrined apology, for as Paul Quinn was led to point out after the Earlier Poems had been published, ‘Clugel’ is in fact a mis-spelling. True, I’d not heard of Jack Vance nor had the editor, but the confusion is instructive: it illustrates not just the difficulties (if that’s what they are) of reading but also both how distinctive Griffiths’ textures are and how remarkably effective the editing has been that we aren’t led to suspect chimeras of this kind. There must surely be other doubtful versions that have slipped through the net of silent correction but, even if they reorient it when one knows better, they simply don’t trouble the reading. it’s the very loneliness of the path it treads that opens the way for the reader. It also opens very great and unique beauties that will stand comparison with any in English poetry and which are now available in a substantial volume whose editing — a well-nigh impossible task to complete satisfactorily — is intelligent, unobtrusive and clear. These are achieved beauties derived from an integrity of vision whose sweep takes in the immediate prospect by doing simply, sadly, comically, puzzlingly, and very engagingly what it says — ‘looking to see what is out there’.